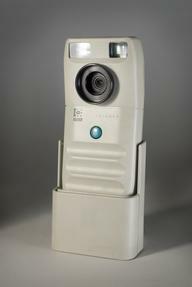 Pantascopic camera No 32, 1862. For flat plates. With an A Grubb patent achromatic lens with disc stops. Camera driven by clockwork motor, gearing with rack on inside of tripod head and held in mesh by thick rubber band. Air vane governor. In operation, string wound round tripod head pulled plateholder (missing) past slot in camera back on steel track with folding ends for transport. Spirit level (dry). J R Johnson. Overall: 220 mm x 312 mm x 190 mm, 187 mm (dia. base). 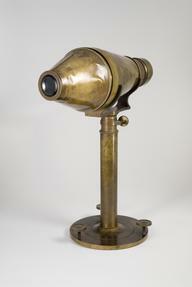 Pantoscopic camera, made by Johnson and Harrison in England, 1862. 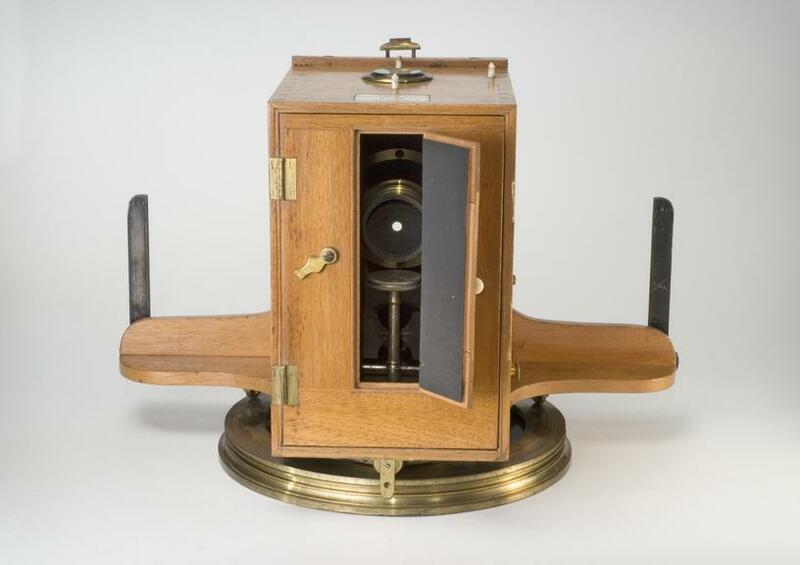 This box-form camera, made by Johnson and Harrison, was one of the first to be designed to take panoramic photographs on glass plates. The images it produced were of a 110º view on 7½" x 12" flat collodion plates. 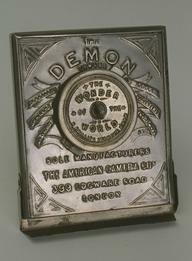 As the clockwork motor rotated the camera, the glass plate was moved past a slot in the camera back, to make the exposure.